One of our volunteers, Mary-Jane, recently enjoyed the holiday of a life-time in Tobago, where she met the amazing team at Healing with Horses. 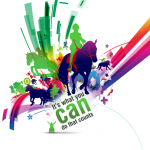 Veronika and Lennon acquire horses and ponies which have been retired from racing, are unwanted or have behavioural or health problems much as they attract children and adults with different abilities. Their philosophy is all about the herd and allowing the horses a natural, healthy life. Each day the herd is brought in from the pasture where they are cared for by local children and adults who have different abilities as well as a group of volunteers. The children also enjoy craft time, plaiting manes and tails and adorning the ponies with flower garlands. It gives them a real sense of understanding of these beautiful animals. 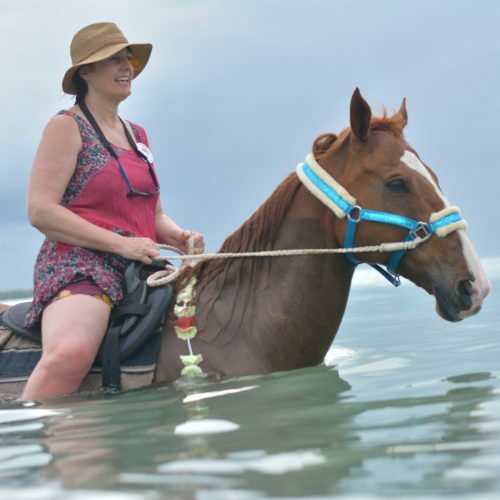 Tourists can also enjoy the experience, paying to take a ride along the beach and swim the horses through the sea (see Being with Horses). The whole herd comes out on the daily ride, with or without a rider, and the sea water and swimming is amazingly therapeutic for them.